Bargain property! 4 bedroom terraced country house with land of approximately 1000m for sale, Albox. This great property has lots of potential! It is located within walking distance to a popular bar/ restaurant and petrol station and the friendly village of Las Pocicas is just a 3 minute drive away where you can find basic amenities such as a doctors, a convenience store, bars, a school for young children and a communal swimming pool. The larger market town of Albox can be reached in just 15 minutes. 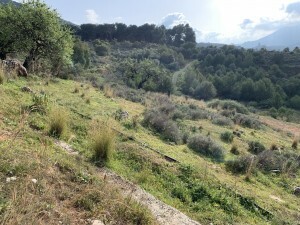 The property is accessed via a tarmac road and just a short drive on a rambla. There is plenty of parking space. To the front of the property is a spacious paved terrace. Through the main entrance door is the good sized lounge with and open fireplace and two doors lead into two double bedrooms. In one of the bedrooms there is a staircase which leads upstairs. Upstairs there are two large rooms which could be divided into another 2 bedrooms and a bathroom. Back downstairs and in the lounge a door leads into the family shower room and beyond here is a lounge/kitchen with a large fire place. Next to this room is another small building which was used to keep animals. With the property there is a large plot of land of approximately just over 1000m where there are many planted Almond trees. The property has mains electric and has a 18.000L water tank which gets filled with water rights each month. A bargain property definitely worth viewing! Contact us now to arrange an appointment!